This is interesting, an altogether rare animal of a 30 minute primetime quiz in 2018. In fact we struggle to name any 30 minute quiz in the modern era. 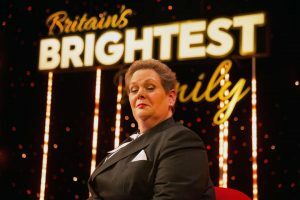 This one is hosted by none-other than Chaser and Bother’s Bar favourite Anne Hegerty in full Governess mode which is a very interesting use of built-up channel talent – she can certainly answer questions but can she ask them? 16 families take part in a knockout competition across the series leaving one to win a holiday of a lifetime. It sounds like there are rounds testing mental agility as well as general knowledge questions, and it also sounds like the kid on the team will have to decide who will face the questions. And there are armchairs that raise and lower. It’s sandwiched between two episodes of Coronation Street so it has every chance of doing well but will it stand on its own merits? Let us know what you thought of it in the comments. Krypton Factor revival is the last I can think of, but as for new shows on ITV completely could it be all the way back to Who Wants to be a Millionaire? Really hope it does well and open the door to more – much better schedule filler than cookery shows or celebrities in the countryside. What about The Lie? The Scottish version has 30 minutes, but I don’t know about anywhere else, though. Yes, The Lie is a good shout, was 30 minutes in its native Ireland as well. Richard O’s House of Games was another 30 min one, wasn’t it? Yes indeed, good spot. In fact all the BBC2 6pm ones to be fair (I think 6pm just about counts as prime time). And University Challenge. And Only Connect. And a Question of Sport. Though if you want to be REALLY pedantic the BBC Daytime team commission shows for the 6pm hour on BBC2! The hydraulic chairs seem like they were built for a completely different type of show. A very strange gimmick that they’re not making much of because they’re so pointless. Well… it’s alright I suppose. Questions are too easy for dedicated quizzers, except for those where four quite detailed diagrams are displayed at once, making them too small to examine from the sofa, even on my large HD set. Yes, they shrunk the clues far too quickly which frustrated the playalong element. Chairs a pointless gimmick and don’t seem to fit the show at all – the arrows were sufficient. Would also be better for the opposing teams to have chairs in different colours. Round 1: 5 questions worth 10 points, opposition team automatically gets points if you buzz in wrong (same throughout show). You buzz to nominate another team member to answer rather than answer yourself. Round 2 – 4: Head to heads on categories, with one nominated member from each team. Three questions per round, 10 points each. Round 5: As round 1, but double points. It’s an entertaining diversion, not really a must watch, but there were a lot of things I liked about it – I enjoyed the question writing and the variety they contained (very ITV Ask the Family), I enjoyed the Catchphrase style buzzers (although the chairs I can take or leave, I think if the point is surprised reactions it doesn’t really come through). It doesn’t outstay its welcome. Don’t love double points finals but there we are. I like that the contestants seem relatively normal rather than wacky ‘characters’, and that they found kids who weren’t particularly annoying. Anne likely to get an easy ride from public because she’ll have a lot of goodwill behind her but I think it fair to suggest not an autocue natural, but seemed much more happier chatting and keeping the quiz moving which is probably to be expected. Worst bit for me is that some of the questions became particularly difficult to fathom when they shrunk them down to put the family split screen in, and I’m watching on 43 inches – good luck with that Beatrix Potter question. I didn’t think Anne was bad at all actually and far better than just a random rent-a-host (aka Mr Mulhern). Actually credit to ITV over the last year or two they have been much bolder with many of their presenter choices. I’d forgive almost any sin just for casting lovely, regular people (I think the last time us Americans got that was Race to Escape), but it didn’t really have much to forgive, thankfully! If it had been on in daytime I migh have lambasted it for failing to be a bit braver, but it’s surprisingly nice to have such an unassuming little quiz going out in prime time. 4.31m for episode one is the suggestion, which is a hit (one episode not a trend etc), although the caveat is it was in the middle of a 7m Corrie sandwich. Questions a bit on the easy side and difficult to see properly. I like Anne but she’s not quite a natural yet and the sound was a bit strange. The chairs are ridiculous and embarrassing and must make the contestants feel silly. I’ll stick with it for now and see if it settles in. I can’t see how this show will get a second series. The questions are ridiculously easy. The researchers did a god job in finding families who were dim enough to make a contest. Anne is not a natural presenter and I don’t understand why she finds it necessary to explain the answers to easy questions. What is the point of those chairs. Thumbs up from me, hit the spot surprisingly nicely. I rather like the chairs; they are an indicator of family fun, but they’re not just a gimmick, they’re a clearer indication of who has to answer than just relying on the arrows alone. I liked the variety of the question styles, though hopefully there are quite a few different question styles set to enter the mix over the remaining weeks. Anne’s introduction of humour keeps the tone jolly rather than overtly worthy, and it’ll always be a giggle when there’s inter-generational rivalry in the individual rounds. Anne worked very well in context and I hope this can do a job for ITV at what I suspect is a relatively reasonable cost. It’s a fine show. I like it, questions are easy but you have to remember that children have to answer the questions too. It’s also the qualiyfying round, the questions may get tougher once after the heats. Anne wouldn’t be my first choice of the chasers to host a family quiz choice. That would be Paul Sinha, he can be serious but he knows how to entertain since he is also a comedian. One of the better ITV gameshows in recent years. Over 400k down on opening. This show Really annoyed me.. They ask the question and put it on screen and then shrink the screen to show us the contestants! Which means we can’t see the questions as they are to small! ( we haven’t all got giant tv’s) we know who the contestants are so we don’t need to see them until the buzzer goes… In the meantime the viewers like to SEE if they can work out the answers but can’t see the questions! What idiot thought this out ( or not) even the Chase lets you see the questions. Well the questions are so ridiculously easy I know the answer well before the screen shrinks. Anne must be embarrassed having to ask such easy questions but I expect the money makes up for it. Britain’s Brightest Family will be a family who did not appear on this show. Judging by the last two comments, this show probably won’t make the 2018 Hall of Fame… but I don’t think it’s bad enough to deserve a place in the Hall of Shame, either (although it might bubble under). Bit of a set change, and they’ve got rid of the bouncy chairs. Sounds to me like a few format changes too: Note that there were no timed rounds in the original format, yet we clearly hear Anne say “Your time starts now”. Also note the big “£25,000” graphic flashed up near the end – are we playing for a cash prize now, rather than a trip to NASA or whatever the second series prize was? Yes and yes, there’s some sort of new memory round and the series prize is £25,000.